To celebrate Octoberfestthe Helles Lager is back by popular demand! The Helles Lager, on tap 11, is light only in colour, not flavour! The balance of subtle rich maltiness and lingering noble hop character makes for an enjoyable beer that pairs well with food. 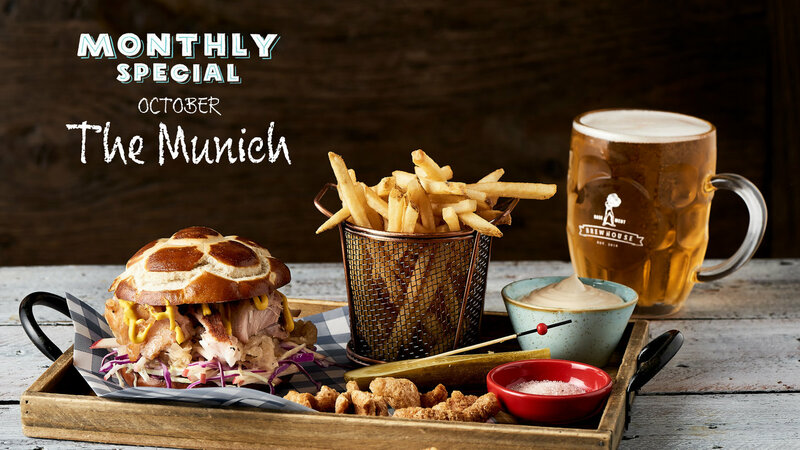 For the month of October, Basement Brewhouse will be serving up The Munich Burger which pairs perfectly with the Helles Lager. The Munich will be sure to please with pulled pork knuckle, sauerkraut, red apple cabbage slaw, aioli and German mustard, served on a delicious pretzel bun. No burger is complete with fries, so of course The Munich comes with crispy shoe string fries and a pint of our exclusive Basement Brewhouse Helles Lager, all for just $25! This is one German feast you won’t want to miss out on. The Munich is only available for the month of October, so head down to the Brewhouse before we have to say Auf Wiedersehen to this taste sensation. You can also try the Helles Lager at Platform One whilst indulging in a delicious 2 course German feast. Exclusively with this menu in Platform One, your first pint of Brewhouse Oktoberfest Helles Lager is only $5, with and all additional Brewhouse Octoberfest Helles Lagers purchased $8. The Authentic 2 course German feast is available Monday to Friday lunch and dinner. Saturday dinner only. Bookings essential, $39 per person.